Benefitfocus, the cloud-based benefits management platform and services provider, recently hosted 1,200 benefits professionals at their annual One Place conference in Charleston, S.C. The conference featured updates on Benefitfocus’ strategy, enterprise benefits management technology platform, and partners from its ecosystem; and presented an opportunity to learn from industry thought leaders, technology partners, benefits suppliers, and insurance brokers. On the final day of the event the company facilitated employer efforts to build benefit strategies and experiences at what was billed as the industry’s “largest open enrollment planning event”. During the event, Benefitfocus updated customers and ecosystem partners on seven key topics, as covered in this blog. Benefitfocus has embarked on a significant strategic realignment. The company is shifting its company strategy from selling software to facilitating a benefits industry platform (or marketplace, such as Amazon). The company has been influenced by the book Platform Revolution, written by MIT professor Geoffrey Parker, who was introduced via a recorded video after having visited the company at its campus headquarters in South Carolina. Parker’s book instructs leaders how to start and run a successful platform business such as Amazon, explaining ways to identify prime markets and monetize networks. Development of an ecosystem partnership within a complex web of coopetition (in which medical carriers, for example, may currently go to market on the Benefitfocus SaaS software, white label Benefitfocus, and/or go to market concurrently with their own home-grown development platforms). 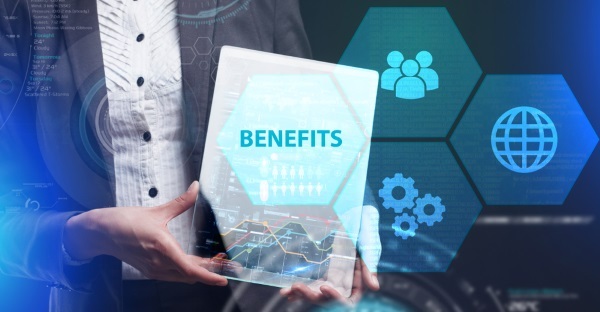 Development of the benefits administration professional community within Benefitfocus’ ecosystem of employers, consumers, and benefit providers. Mobile App: It is now possible to email or text health data to a physician, including proof of insurance. This is a service not only for the consumer but for the insurance carrier that wants to have accurate data conveyed to physicians in real-time. The Mobile App aims to simplify consumer engagement, total rewards details, and digital ID cards. Enrollment can now be accomplished using the Mobile App. Chatbot: Embedded in AI engine BenefitSAIGE, this 24-hour chatbot drives content and recommendations to consumers every type of benefit at every stage of life. It also frees the HR professional who is ordinarily called to interface with consumers about the benefits platform and benefits companies. Chatbot communications limit delays generated by hand-offs as a consumer inquiry passes to the HR professional, to a benefits broker, to a benefits vendor, and then returns back to the HR professional and finally the consumer. The chatbot also drives appropriate benefits enrollment in “smart moments” that matter to consumers. Digital Wallet: This feature enables flexible payment options beyond payroll deduction. Payment using personal credit cards can also be accomplished using the Mobile App. The platform now allows employees to purchase insurance at any time during the year, not just during a two-week open enrollment period. Ecosystem productivity enhancements via data exchange, APIs and automation, supported by security and data protection. Benefitfocus reports that over 25m consumers are now served by its software platform. Clients include 170k+ employers, from Fortune 500 companies to small employers, featuring 17k brokers, 144 medical benefits carriers, and 30+ marquee voluntary and specialty benefit brands. The company reports that a $30m investment has produced a dataset with “99.6% data accuracy on first-pass yield, eclipsing the industry average of 95%”. The dataset includes records of 2.7bn data transactions in 2018 alone. BenefitsPlace now features Afficiency, an InsurTech that is working with life insurance carriers to offer portable voluntary life insurance benefits. The company has also added greater choice of consumer-directed healthcare (CDH) account options, including Wageworks and Payflex. API connections are designed for synchronized, accurate and real-time data exchange. Year-round education and communications should help consumers maximize their CDH contributions, including the triple-tax benefits of funding their HSAs. Toggle: launched by Farmers Insurance in 2018 (renter’s insurance). Benefitfocus offers P&C insurance through licensed brokers at discounted rates. Benefitfocus announced its InnovationPlace, a startup partner program. The company aims to introduce innovative products and services to employers and their employees through its SaaS facilitated marketplace. The company has created an innovation incubator on the company’s South Carolina campus, and welcomed its first occupant, Rock Health, an innovator in women’s health.